"Fegefeuer Anilmathiel" has once again released another brilliant album that I believe you all should check out! "Fegefeuer Anilmathiel" is an one-man band from Spain; lingering within the realms of invigorating Ambient/Atmospheric Black Metal. " 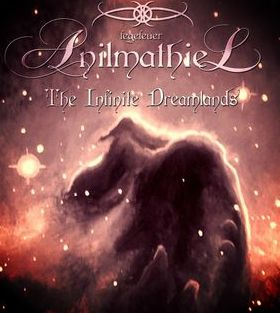 The Infinite Dreamlands" has definitely led the "Fegefeuer Anilmathiel" into a whole-new direction and I must say I love it! Their previous musical lore focused more on a medieval, folk, fantasy universe, topics and that's where the twist comes in with "The Infinite Dreamlands" album. The current theme now focuses on a more astronomical ideology of existence, space and just the universe as a whole. The music really grasps onto those concepts and contorts them into something monumentally unique, beautiful, and yet so darkly eerie. It seems (Lyrically speaking) the Space-oriented side of Black Metal is dying out, but this album did its justice & revitalized that! Eight-tracks reside on this album, lasting about an hour long, (59 minutes) in which I would say is definitely a considerable length for an album of any genre. Sometimes it feels as if the song itself drags on far too long, additionally increasing the feeling of tedium. Also, I felt a lack of pin-point specific melodies that would symbolize and/or idolize a band trademark. The worst thing about that is if you don't include that key factor & style, it can destroy the ability of 'standing-out' from other bands. Even with that though, the music is astounding! Overall, I honestly believe that it's a phenomenal band! The dark, space, & ominous atmosphere that are given off is extraordinarily spectacular and can really hook you in. So content, so soothing, so beautiful. I'm not sure if I can say this new style of "Fegefeuer Anilmathiel" will be permanent, but I cannot wait to hear what's in store for the future!